1 Melt the bars of chocolate in a glass bowl over a saucepan of hot water, making sure the water does not touch the bowl. 2 When the chocolate is melted set aside for one minute. 3 Cover a small to medium baking tray with grease proof paper. 4 Add the mixed seeds and dried cranberries to the chocolate and mix, then pour onto the baking tray and spread it out evenly. 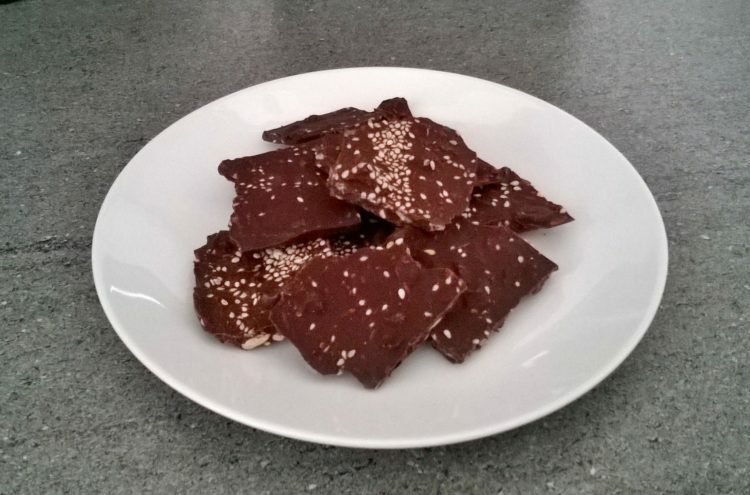 5 Sprinkle the sesame seeds on top, and place in the freezer for 10-15 minutes. 6 Then remove the chocolate from the freezer and place on a chopping board. Cut into squares and enjoy! PS Chocolate squares are best kept in the freezer, ready for a little treat.